After SXSW 2001, I spent a few days in my old stomping grounds. During the stomping I passed a video rental store which had closed down. 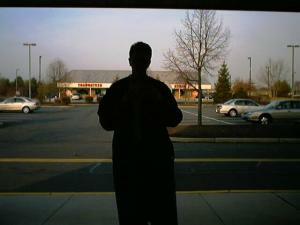 The blackness inside showed me an interesting reflection of myself.I reflected a lot in those days.In the background is a typical NJ Diner. It's one of the few things I miss about the place.